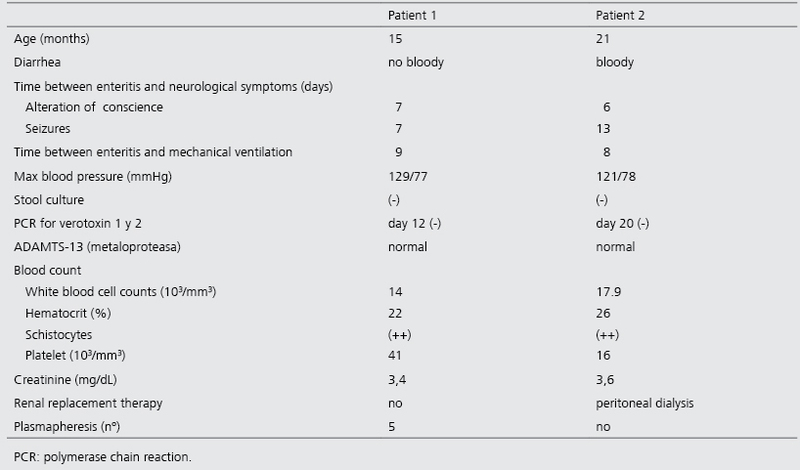 Introduction: Diarrhea-associated Hemolytic Uremic Syndrome (D+HUS) is a multisystem disorder in which neurological involvement (35 to 50%) is associated to adverse outcome. An important cause of a permanent neurological impairment is the cerebrovascular pathology. Objective: To report two pediatric cases of D+HUS with severe neurological involvement due to cerebrovascular disease, and review available literature. Clinical cases: Two previously healthy 15- and 21-month-old children debuted with seizures and impairment of consciousness within the first week of a D+HUS. Both presented hypertension, severe acute renal failure, and focal motor deficit. One child showed significant improvement in neurologic status after five sessions of plasmapheresis. Brain magnetic resonance showed in the first child multiple bilateral infarcts of small vessels and lesions of white matter. In the second patient, large bilateral infarcts on both middle cerebral arteries territories were identified. One year after the acute event, both children showed functional impairment; The first patient evolved with language delay and spastic hemiparesis; the second patient with spastic quadriparesis, epilepsy with poor seizure control and marked functional impairment. Conclusion: Although most of the children with D+HUS and brain involvement do not have long-term sequelae, cerebrovascular disease in the acute period causes permanent damage, and in addition to the management of electrolyte disturbances, hypertension, and renal failure, therapies directed at specific pathophysiological mechanisms that trigger vascular compromise may improve prognosis. Diarrhea-associated Hemolytic Uremic Syndrome (D+HUS) is a multisystem disorder and the leading cause of acute renal failure in children aged < 4 years. It is triggered by gastrointestinal infection, commonly due to a Shiga toxin-producing Escherichia Coli (E. Coli) serotype O157:H7. A distinctive triad characterized by acute renal failure, intravascular hemolytic anemia, and thrombocytopenia constitutes the basis of diagnosis. Thrombotic microangiopathy has a central role in the pathophysiology of hemodynamic alterations of D+HUS. These disturbances can include the central nervous system (CNS), gastrointestinal tract, pancreas, liver, and kidney1-4. Neurological involvement occurs in 35 to 50% of D+HUS cases. Endothelial dysfunction (associated with complement activation induced by Shiga toxin), arterial hypertension, and hydroelectrolytic disorders (commonly hyponatremia) are involved in CNS dysfunction. Although neurological manifestations can go back with the standard treatment of D+HUS, in cases of brain parenchymal injury the long-term neurological morbidity reaches up to 50%. Thus, an early brain magnetic resonance imaging (MRI) allows identifying ischemic lesions and vasogenic edema of the brain parenchyma5,6. To date, no clinical studies are reporting a specific therapy for D+HUS. Hemodynamic stabilization, hydroelectrolytic balance, and acute renal failure management (including renal replacement therapy to support critically ill patients) are the basis of treatment. Furthermore, some immune-therapies such as plasmapheresis and use of antibodies against complement proteins may be useful alternatives in patients with severe CNS involvement7-10. According to Zambrano and Prado, the incidence of D+HUS in Chile is around 34/ 100,000 children aged < 4 years, with a mortality of 2,9%11,12. There are no reports of clinical characteristics or outcomes of D+HUS children with neurological involvement on acute period. 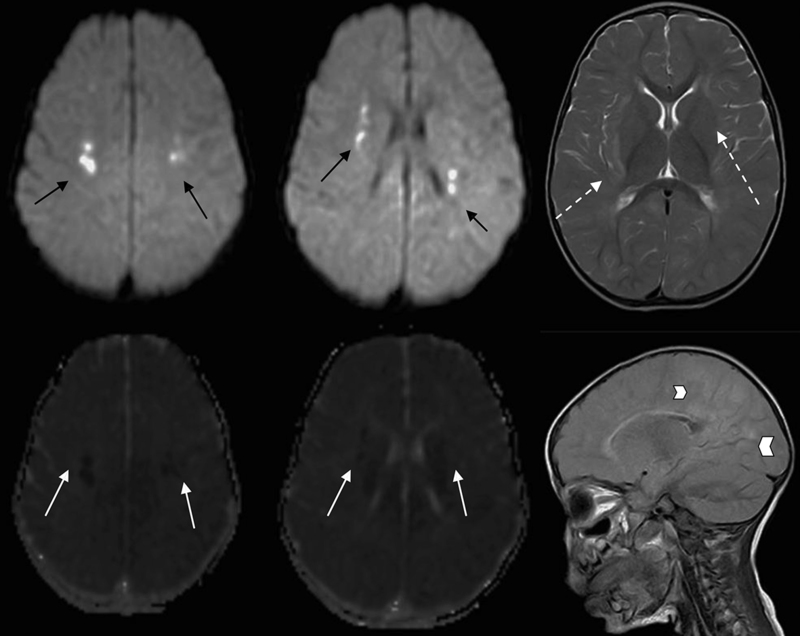 The objective of this report is to describe clinical manifestations, neuroimaging features, and neurological status at 24 months of 2 D+HUS children with severe CNS involvement due to cerebrovascular dysfunction. We discussed respect to the existing therapeutic alternatives for neurological impairment in these patients. The Research Ethics Broads of the Pontificia Universidad Católica approved this study. A 15-months old previously healthy boy who had traveled outside the metropolitan region was admitted to a rural hospital. He was receiving treatment for acute non-dysenteric diarrhea, hyperemesis, and recurrent episodes of tonic-clonic seizures managed with phenobarbital. Laboratory findings were consistent with D+HUS. As his condition gradually progressed to renal failure and persistently elevated blood pressure, he was referred to our hospital for renal replacement therapy. During his stay in our institution, he presented progressive renal and hemodynamic improvement with pharmacological management (furosemide, hydralazine, and nifedipine), so he did not require dialysis. However, on the 9th day of evolution, he required invasive mechanical ventilation (IMV) due to impairment of consciousness and generalized seizures. MRI prior IMV showed acute white matter ischemic lesions in the corona radiata, periventricular, and parieto-occipital areas (Figure 1). Five sessions of plasmapheresis were performed due to the adverse neurological evolution, with a progressive improvement of mental status and seizure control. At 6 and 12 months of discharge, the boy presented a right spastic hemiparesis and a moderate delay in language. Because he did not present any seizures at 24 months, the antiepileptic treatment was progressively discontinued, without recurrence of seizures (Table 1). Figure 1. Patient 1: MRI taken on the 18 h after neurological symptoms showing diffusion restriction in bilateral centrum semi-ovale (figure a y b White and black arrow) and bilateral corticospinal tracts (figure c and d; White and black arrow). In T2 (e, dotted arrow) and FLAIR (f, head arrow) show bilaterales hyperintensities of capsula externa (e) and parieto-occipitales zones (f). A 21-months old previously healthy boy from rural areas who presented acute dysenteric diarrhea and hyperemesis was initially treated with furazolidone, however, due to the presence of severe dehydration was admitted in a primary hospital at the third day of evolution with a normal hemogram and renal function study. At the sixth day, the boy had a sudden onset of impairment of consciousness, pallor, generalized edema and oliguria. Laboratory findings were consistent with D+HUS. He presented a progressive renal and respiratory failure due to an intercurrent infection. Thus he required renal replacement therapy (peritoneal dialysis) and IMV for four days. After extubation, the patient developed impairment of consciousness, generalized tonic seizures, and focal motor deficits. A first brain CT and posterior MRI with MRA showed extensive infarctions in the territory of both middle cerebral arteries (Figure 2). He was referred to our hospital for the management of refractory epilepsy. At admission, he had a qualitative alteration of consciousness, spastic quadriparesis, and a severe swallowing disorder which required a gastrostomy and fundoplication. At two years of follow-up, the boy persisted with spastic quadriparesis, epilepsy with poor seizures control and a marked functional deterioration, but with oral feeding and preserved eye contact (Table 1). Figure 2. Axial (a) and coronal view (b) of CT brain, in patient 2. In the 8th day; extensive signal hypointensities changes of both middle cerebral artery (white arrow). MRI-FLAIR in the 21th day, show involvement bilateral of cortical, subcortical zones y basal ganglia by ischaemic lesions (c, d, white arrow). Conventional Angiogram shows occlusion branche M2 of right MCA (up, black arrow negra) and occlusion of the segment M1 in the left MCA (abajo, dotted black arrow). About half of patients with D+HUS have acute neurological manifestations such as headaches, qualitative and quantitative compromise of consciousness, language disturbances, movement disorders, weakness and epileptic seizures, which are usually due to cerebral edema caused by hyponatremia. Although in pediatrics the acute CNS involvement is described as transient and reversible, studies in adults suggest that the frequency of cognitive impairment in children is probably underestimated13. Our patients presented severe neurological disturbances associated with D+HUS, developing in both cases permanent motor and cognitive sequelae in addition to epilepsy. Although in these children, the neurological deterioration was evident, it is relevant to perform a standardized neuropsychological study to all patients with neurological manifestations in the course of D+HUS to determine the requirement for specific therapies. Retrospective studies of clinical series with a high number of pediatric patients have found a severe neurological involvement during the acute period of D+HUS in 25.6% of cases, with persistent deficits in one-fifth of them and mortality of 17%. Adverse outcomes would be associated with demyelinating lesions and brain ischemia4,14. In our patients, MRI showed symmetrical and bilateral ischemic lesions. Patient 1 also showed diffuse white matter lesions in the subacute-chronic period. Patient 2 presented a stenosis of the M1 and M2 branches of both middle cerebral arteries, probably in the context of endothelial damage due to Shiga toxin. A retrospective study that included 52 children with diarrhea and severe neurological involvement14, demonstrated a high frequency of focal lesions in terminal brain circulation. In this study, there was no statistically significant association between the location of the lesion and the prognosis, unlike to our cases in which MRI lesions had a high concordance with the long-term neurological sequels. Cerebrovascular lesions observed in MRI depend on the underlying pathophysiological changes on the course of the disease. There are, in general, 3 types of lesions: (1) Hemodynamic infarcts with or without hemorrhagic transformation of terminal vessels located in the basal ganglia and periventricular white matter during the acute phase. (2) Cortical cytotoxic edema due to coagulative necrosis with irregular distribution during the subacute phase, mainly due to large to large vessel microangiopathy. (3) Symmetrical vasogenic edema predominantly in the parieto-occipital regions due to multifactorial endothelial damage (strongly associated with prolonged or ictal hypertension) during the late phase (encephalopathy due to brain hyperperfusion, formerly known as posterior reversible leukoencephalopathy)13,15-18. Currently, new techniques in brain MRI have been described as the susceptibility sequences (SWI: Susceptibility-Weighted Imaging). These sequences detect hemodynamic brain changes in up to 92% of symptomatic patients, visualized as loss of venous contrast that would reflect the increase in cerebral blood flow due to severe acute anemia. This new technique would allow the early detection of children at high risk of brain damage by low flow, allowing optimal management of their disease19. As previously mentioned, the correction of hemodynamic alterations, hydroelectrolytic misbalances, and acute renal failure is the basis of the treatment of neurological compromise in D+HUS. However, some specific therapies linked to the underlying pathophysiological changes could improve symptoms in the acute period and reduce long-term neurological morbidity. In one of our patients, the use of 5 sessions of plasmapheresis was correlated with rapid and significant symptomatic improvement. Although Colic et al, in 2011, demonstrated the decrease of CNS complications in adults with D+HUS undergoing plasmapheresis, these results have not been replicated successfully in pediatric populations20, so the indication must be evaluated case by case. In recent years there has been increasing interest in the potential benefit of the use of complement protein antagonists, such as eculizumab (a monoclonal antibody that would specifically and irreversibly block the C5 component) that would stop the cascade leading to the development of thrombotic microangiopathy. Moreover, that has demonstrated efficacy and safety in the management of atypical HUS with severe systemic alterations21. The results of this treatment in children with severe neurological compromise due to D+HUS are still uncertain, so it is necessary to critically evaluate the results of the studies that are currently carried out before recommending their use7 – 10, 22. In our patients, there was no history of unsafe dietary intakes or affected family in the preceding period or concomitant with the clinical picture. However, in patient 1, diarrhea began while he was out of his region of origin during the summer, without access to drinking water and patient 2, lived in a rural place and they consumed water from streams of water. We do not know the electrolyte status of children before referral to our hospital. It is possible that cerebrovascular symptoms have been superimposed on those caused by moderate to severe hyponatremia (cerebral edema, intracranial hypertension). Similarly, although no lesions resembling central pontine myelinolysis, bilateral periventricular lesions may suggest a central extrapontine myelinolysis, by rapid correction of natremia. Therefore, it is necessary to bear in mind the initial hydroelectrolytic state at the time of treating a child with D+HUS21. Antibiotic prescription and late recollection of stool samples for analyses, likely explain the absence of detection for the etiological agent. Clinical and laboratory characteristics also discarded atypical HUS. Although the neurological involvement in D+HUS is frequent, it is usually due to reversible conditions. Cerebrovascular diseases are a cause of permanent CNS damage, which must be detected early to optimize treatment and thereby improve long-term prognosis. The severity of the underlying systemic alterations predicts the level of permanent neurological compromise. Therefore, the treatment of arterial hypertension, hydroelectrolytic alterations, and renal failure continue to be the fundamental pillar in the prevention of neurological damage. Even so, in severe cases, the use of specific therapies could be beneficial. 1. Mele C, Remuzzi G, Noris M. Hemolytic uremic syndrome. Semin Immunopathol. 2014;36(4):399-420. 2. Banatvala N, Griffin PM, Greene KD, et al. The United States National Prospective Hemolytic Uremic Syndrome Study: microbiologic, serologic, clinical, and epidemiologic findings. J Infect Dis. 2001;183(7):1063-70. 3. Karmali MA, Petric M, Lim C, et al. The association between idiopathic hemolytic uremic syndrome and infection by verotoxin-producing Escherichia coli. J Infect Dis. 1985;151(5):775-82. 4. Loos S, Ahlenstiel T, Kranz B, et al. An outbreak of Shiga toxin-producing Escherichia coli O104:H4 hemolytic uremic syndrome in Germany: presentation and short-term outcome in children. Clin Infect Dis. 2012;55(6):753-9. 5. Bale JF,Jr, Brasher C, Siegler RL. CNS manifestations of the hemolytic-uremic syndrome. Relationship to metabolic alterations and prognosis. Am J Dis Child. 1980;134(9):869-72. 6. Buder K, Latal B, Nef S, et al. Neurodevelopmental long-term outcome in children after hemolytic uremic syndrome. Pediatr Nephrol. 2015;30(3):503-13. 7. Khandelwal P, Gupta A, Sinha A, et al. Effect of plasma exchange and immunosuppressive medications on antibody titers and outcome in anti-complement factor H antibody-associated hemolytic uremic syndrome. Pediatr Nephrol. 2015;30(3):451-7. 8. Pape L, Hartmann H, Bange FC, et al. Eculizumab in Typical Hemolytic Uremic Syndrome (HUS) With Neurological Involvement. Medicine (Baltimore). 2015;94(24):e1000. 9. Delmas Y, Vendrely B, Clouzeau B, et al. Outbreak of Escherichia coli O104:H4 haemolytic uraemic syndrome in France: Outcome with eculizumab. Nephrol Dial Transplant. 2014;29(3):565-72. 10. Dinh A, Anathasayanan A, Rubin LM. Safe and effective use of eculizumab in the treatment of severe Shiga toxin Escherichia coli-associated hemolytic uremic syndrome. Am J Health-Syst Pharm. 2015;72(2):117-20. 11. Prado Jiménez V, Cavagnaro SMF, Cordero TJ, et al. Hemolytic uremic syndrome associated to shigatoxin producing Escherichia coli in Chilean children: Clinical and epidemiological aspects. Rev Chil Infectol. 2008;25(6):435-44. 12. Zambrano PO, Delucchi AB, Cavagnaro FS, et al. Hemolytic-uremic syndrome in Chile: Clinical features, evolution and prognostic factors. Rev Med Chile 2008;136(10):1240-6. 13. Fujii K, Matsuo K, Takatani T, et al. 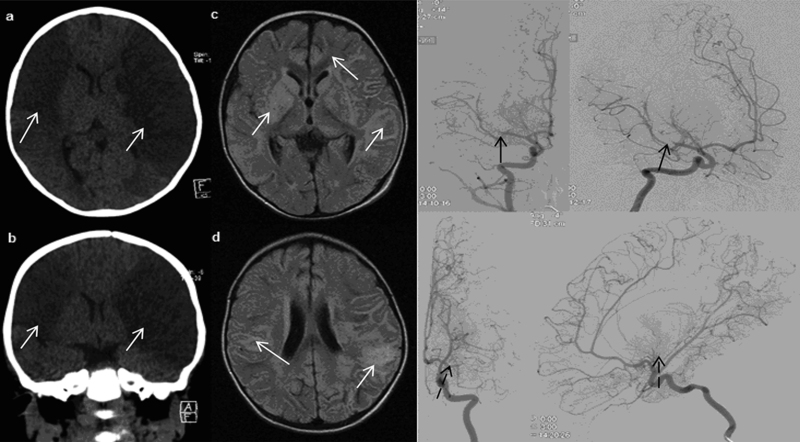 Multiple cavitations in posterior reversible leukoencephalopathy syndrome associated with hemolytic-uremic syndrome. Brain Dev. 2012;34(4):318-21. 14. Nathanson S, Kwon T, Elmaleh M, et al. Acute neurological involvement in diarrheaassociated hemolytic uremic syndrome. Clin J Am Soc Nephrol. 2010;5(7):1218-28. 15. Gómez-Lado C, Martinón-Torres F, Álvarez-Moreno A, et al. Reversible posterior leukoencephalopathy syndrome: An infrequent complication in the course of haemolyticuremic syndrome. Rev Neurol. 2007;44(8):475-8. 16. Hasni Bouraoui I, Gamaoun W, Arifa N, et al. MRI and MR spectroscopy findings in a case of hemolytic-uremic syndrome with central nervous system involvement. J Neuroradiol. 2013;40(1):65-7. 17. Weissenborn K, Donnerstag F, Kielstein JT, et al. Neurologic manifestations of E coli infection-induced hemolytic-uremic syndrome in adults. Neurology. 2012;79(14):1466-73. 18. Hernández-Chávez M, Núñez A, Mesa T, et al. Leucoencefalopatía reversible posterior: cuatro casos clínicos. Rev Med Chile 2008; 136: 93-8. 19. Löbel U, Forkert ND, Schmitt P, et al. Cerebral hemodynamics in patients with hemolytic uremic syndrome assessed by susceptibility weighted imaging and fourdimensional non-contrast MR angiography. PLoS ONE. 2016;11(11):e0164863. 20. Colic E, Dieperink H, Titlestad K, et al. Management of an acute outbreak of diarrhoeaassociated haemolytic uraemic syndrome with early plasma exchange in adults from southern Denmark: an observational study. Lancet. 2011;17;378(9796):1089-93. 21. Avila A, Vizcaino B, Molina P, et al. Remission of aHUS neurological damage with eculizumab. Clin Kidney J. 2015;8(2):232-6. 22. Kavanagh D, Smith-Jackson K. Eculizumab in children with hemolytic uremic syndrome. Kidney Int. 2016;89(3):537-8.